Nice special thoughts and moments of the various seasons. I so remember the wonders of Spring as things in our yard would start to come alive again. It was amazing to see mother nature at work and be surprised each day. It sure is! Remember it with fondness in your happy memories. Hope it makes you happy to think about! Happy Healing my friend! Absolutely beautiful, Jodi! I love this painting! We are enjoying spring here too. Sugar loves to lay in the sunshine and go outside and just sit on the porch in the sunshine. Thanks PJ! Glad Sugar is enjoying the sunshine too! Oh Jodi, you are so talented. This is lovely! Oh.MY.Gorgeous!!! I had to grab some of your cards (I ordered some from both Etsy and Society6!) Couldn’t resist! Oh how sweet of you!!! The cards from Society6 are so fab, but quite pricey! I think you will find them nicer than from my Etsy, but hope you like them too! 🙂 I guess they should be at twice the price LOL! Thanks for making my day! Thanks Susan! Happy Spring to you too! That bouquet is lovely Jodi! Happy Spring! Such a happy painting, Jodi. Thanks Jill! Spring is so exciting! The weather was nice today and your post just made the day even brighter! 🙂 Yay for Spring! 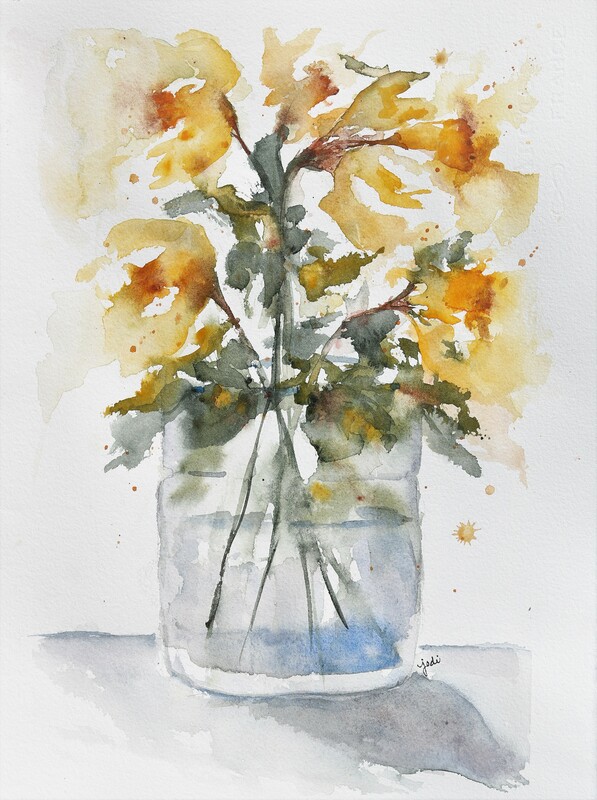 Your ‘Essence of Daffodil in Watercolor’ is indeed the very essence of Spring itself! I have many Daffodil bulbs planted in my gardens, some were there long before I moved here. Somehow, several ended up in the backyard and faithfully come up every Spring for over 15 years with lovely green leaves, but no flowers. Just this afternoon I spotted three buds amidst the leaves and they made me smile! I can’t wait to show Benjamin your beautiful watercolor painting, although he will not be back until Monday. It may interest you to know that he was just talking about “My Jodi” yesterday. It is a bit of a long story though, I hope that you will endure my propensity for loquacity and enjoy it. Yesterday, March 27th, was the first National Scribble Day. I had only read about this two days prior to the event. The day was founded by Diane Alber, the author and illustrator of the Jan.2018 book “I’m NOT Just A Scribble”, her first book. Her idea for the national day is “to share a message of kindness and acceptance and to encourage children to create art no matter their ability. 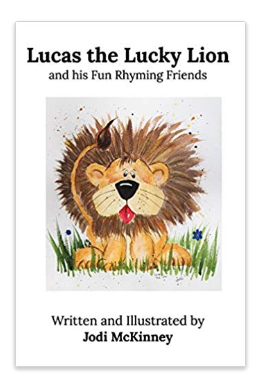 Every artist started with a scribble.” I had purchased the book for Benjamin for Valentine’s Day last year and I have added each of her other three books as they were published last year (another is coming this Oct.). So yesterday Benjamin, Auntie H. and Gem made Scribble men just like in the book on card stock with crayons for everyone. Benjamin loved it, he loved not having to stay within the lines! The book came with stickers of eyes and mouths that are long since gone, but we drew our own onto the Scribbles. As we were making our scribbles, Benjamin said : “Some day I will draw and paint the bestest just like My Jodi does. I bet she drawed pretty scribbles when she was little.” I share this with you for several reasons : 1) To tell you that you have inspired Benjamin’s creativity through your art. 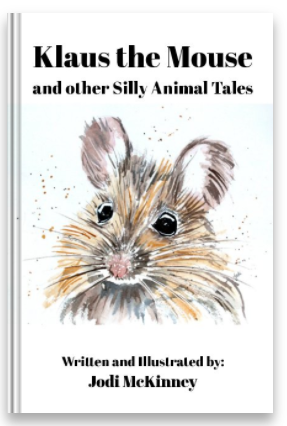 2) To introduce you to Diane Alber and her wonderful series of children’s books to share with your Granddaughters. 3) To have you mark down this date for next year, to share with your two up and coming wee scribblers, they will surely inherit some of your magnificent talent. I would just like to add one last thought…it has been a pleasure and a gift to watch your artistic talent unfold. Every single brushstroke on this painting is lovely and speaks without words. “The artist is nothing without the gift, but the gift is nothing without work.” – Emile Zola. Thank-you! Endure?????!!! Do you know how much this beautiful message made my day??!! Before I could even write back, I went to Amazon and ordered “I’m not just a Scribble.” I cannot wait to read it to my girls! Thank you so much dear Ellen! Thank you even more sweet Benjamin! ❤ I wish I could express how much both of you mean to me… how much your encouragement means… how much you inspire me…. how much I am overwhelmed by your kindness. I will be marking national scribble day on my calendar. My sweet two-year old granddaughter scribbles regularly and they are always beautiful drawings of the people she loves. ❤ As she is "scribbling," she describes who it is, and it melts my heart. Love to you both!!! Thank you so much! My heart is overflowing. YOU have just made, not only my day, but my week!! I was coming back to add a postscript to the above “tome” and found your sweet comment. I had forgotten to tell you to go to Diane Alber’s website, you will love it! There are videos that are enchanting, Benjamin loves them! We love all of her books and I am quite sure your Granddaughters will grow to love them too! I was also going to add a note about the upcoming 100th Anniversary of Children’s Book Week – Every Child a Reader, starting April 29th through May 5th this year. The theme this year is : Read Now, Read Forever. I have most likely shared this quote with you already, but a great quote bears repeating : “Children are made readers on the laps of their parents.” – Emilie Buchwald. No doubt, she meant to add “and grandparents” or perhaps it was lost along the way! Thank-you!! And now I am singing…to everything, turn, turn, turn…there is a season…. I like the way they merge into the air. You did capture the essence of daffodils Jodi! What a wonderful abstraction of the signature flower of Spring! I agree, the beginning of each season is such a joy and celebration of what’s to come. Daffodils have so much personality, the way their heads seem to turn and talk to you or each other, and I can see them doing this in your capture, beautiful Jodi! Thank you so much Jenna! Your sweet comments mean a lot! That is just gorgeous, Jodi! I love the colors and the softness of the lines…. Thanks so much Ann! It was so fun to paint! Gorgeous painting, Jodi! I love it. Thank you Shelly! I sure enjoyed painting it! Absolutely beautiful!! I love the abstract look of flowers. So soft and beautiful! Love your description of your yard. Hard to believe our area West Coast Mountains & your opposite location have so much in common. Daffys everywhere, Forsynrhia brilliant neon yellow. Camilias are blooming apple blossoms. Looking forward to that batefert in the grass thing! This has been one long winter even if it is spring. Love your paintng too. Hugs! Makes my heart swell. Oh, I got my book last week! So cool Love it! Wanted to let you know sooner, & before I forget! Our internet & electricity have been vunerable this year & so is my ipad, so haven’t had predictable time on the computer.